Where are the best places to watch birds in Ayrshire? When are the best times to go? What can you expect to see? This section hopes to answer these questions. The Where to Watch menu splits the entries by administrative area: North Ayrshire, East Ayrshire and South Ayrshire. Alternatively you can use the Search facility to find an entry, e.g. type “Turnberry” to find its entries. Each entry gives location (including OS grid reference and map link), access details, birding notes and any other relevant information (e.g. distance to nearest pub!). Where this icon appears in a location’s entry, this is a link to a detailed section of an Ordnance Survey map for the location (typically where to park). 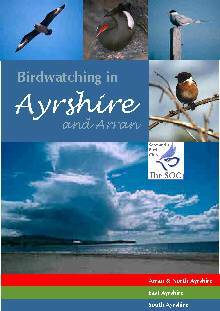 In Spring 2003 we published a 28-page, full-colour free booklet Birdwatching in Ayrshire and Arran containing a summary of the information containing on these pages. We now have so many reports that we needed to organise the sites to make them easier to find. You will see that they have now been grouped by district and then further sub-divided by area, and listed alphabetically. This hopefully makes it easier to find nearby places to watch birds when you are in an area.If an entry has a number in brackets next to it, e.g. 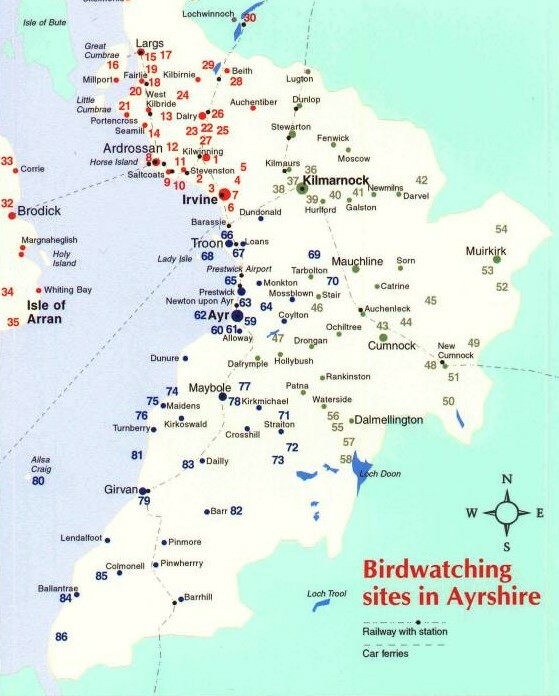 (8) for Ardrossan, this is its index in the Birdwatching in Ayrshire and Arran guide. The Map page shows where all the sites are. To make life that bit easier, the numbers on the map tie in to the numbers used in the Guide. Obviously, this list is not exhaustive: there are many other locations in the County rich in bird life, it’s just that no-one has written about them. If you know a good site that you think others would like to explore then please send in a report to the Web Maintainer. Similarly, if you spot an error or omission to a report then please let us know so it can be rectified. Most location reports include information on suitability for disabled access (positive or negative). This is indicated by the disabled symbol in the text. This has been provided by Robin Turner and follows the recommendations of the Disabled Birders’ Association. We would be grateful for any updates or enhancements to this information. Most location reports include details of suitability for access via cycle, indicated by this icon. You’d think it would be obvious but unfortunately we have to make absolutely clear that nothing in these location reports guarantees safe access, that the birds mentioned will be there, that it will be exactly as described, or that the sun will shine. Information is provided to give you some idea of the suitability of the site before deciding to visit so you can avoid sites totally unsuitable to your particular abilities/needs. The final decision and responsibility for your safety is yours. When visiting any site please respect owners’ wishes and observe the Birdwatchers’ Code. The locations listed below all occur frequently in the Ayrshire Bird Report . However, for many records the place might not be so well known. We have prepared a gazetteer that lists the 160+ places mentioned in the 1999 Bird Report (a typical year, I hope) together with the OS grid reference to identify the location.